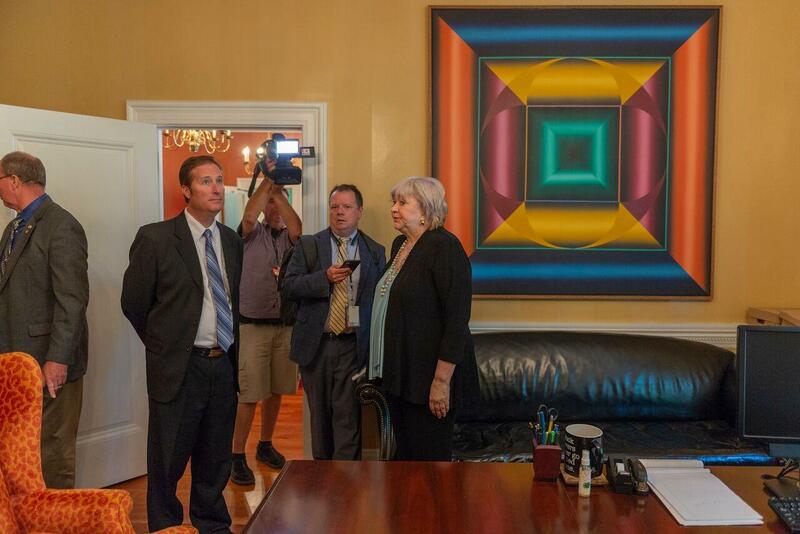 West Virginia Chief Justice Margaret Workman speaks to media and delegates during a tour of court offices on Monday, Aug. 6 2018. 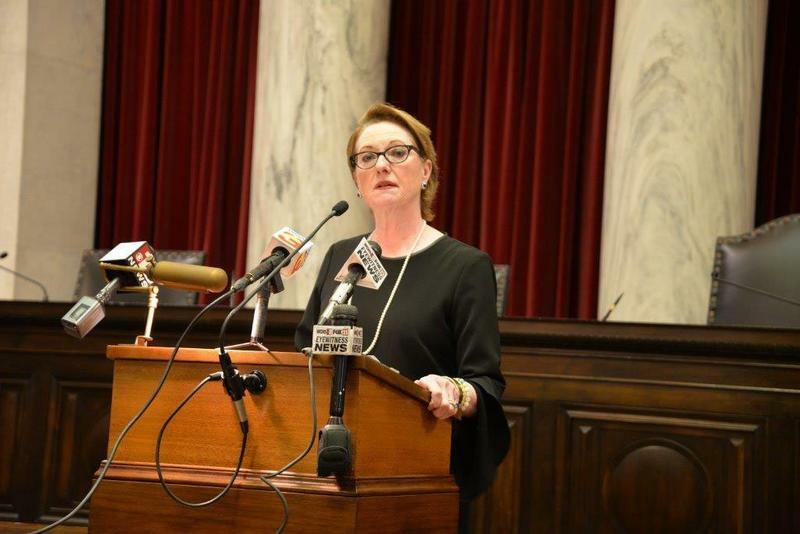 Two justices of the West Virginia Supreme Court of Appeals say they will not resign, despite being impeached by the House of Delegates. The Tuesday announcements from Chief Justice Margaret Workman and Justice Beth Walker came hours before a deadline that would trigger a November special election to fill the remainder of any terms left by vacancies. Their statements followed the resignation of another justice Tuesday. Workman, who was elected to the bench as a Democrat, was impeached through two articles adopted Monday. She was charged by the Republican-controlled House of Delegates for failing to provide administrative oversight of the court and authorizing the overpayment of senior status judges, a violation of state code. Workman’s announcement came after Justice Robin Davis stepped down from the court Tuesday morning. Davis announced her retirement in the chambers of the state Supreme Court. She was also impeached for the same offenses as Workman as well as for lavish spending on court office renovations. In a statement, Workman vowed not to resign from the court or from her position as chief justice. 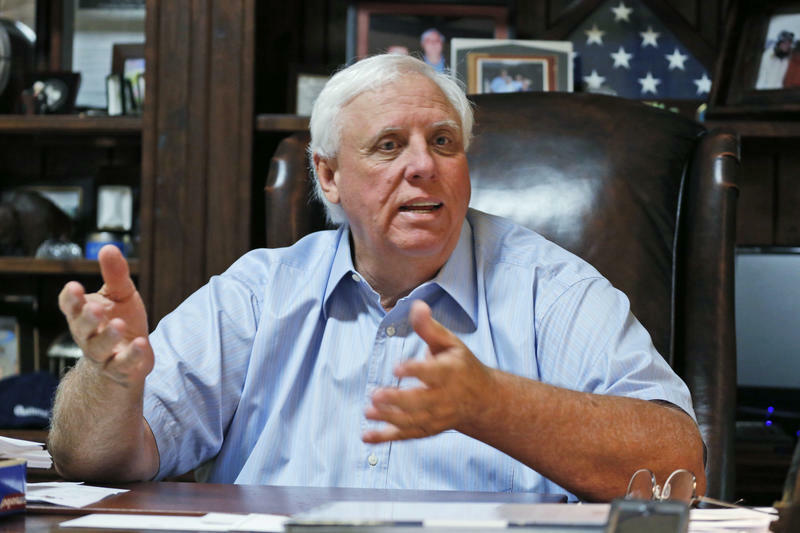 “There is no basis for my impeachment, and I will continue to do the work, both administrative and judicial, that the people of West Virginia elected me to do,” she said. Workman said the cases set for the fall term, which opens September 5, will be heard and decided as scheduled. Last week, Workman appointed Circuit Judge Paul Farrell to the state Supreme Court bench. According to an administrative order, he will preside over the Senate as acting chief justice during an impeachment trial. The state constitution says the chief justice or another justice must preside over the upper chamber. “I look forward to putting all the facts before the Senate in the next phase of this process,” Workman said. Justice Walker -- who was elected in a non-partisan election in 2016 but lost a 2008 bid for the bench as a Republican -- issued a separate statement Tuesday. She also stated that she will remain on the bench and face trial. "I remain committed to my oath of office and to serving the citizens of this great state. My focus will be on earning their trust and confidence and restoring integrity to their Supreme Court. 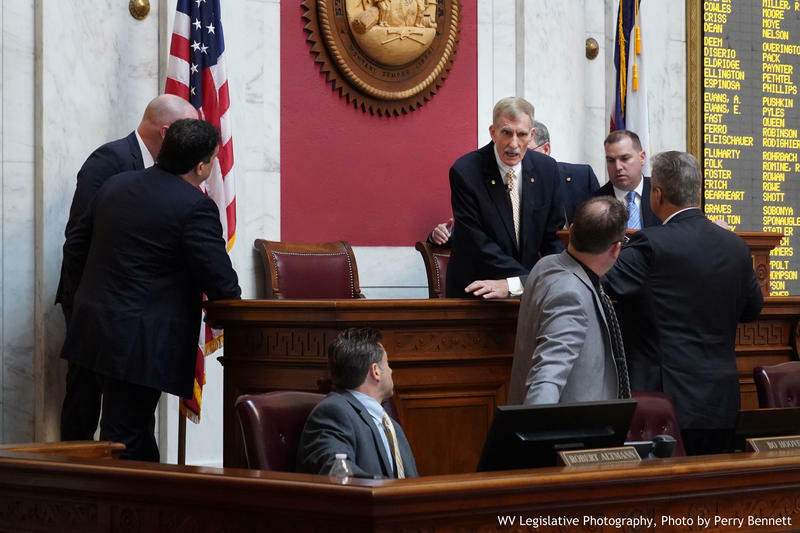 Even though I disagree with some of the decisions of the House of Delegates, I respect their important constitutional role in this process and I take full responsibility for my actions and decisions. I look forward to explaining those actions and decisions before the State Senate," Walker said in a written statement. Walker also acknowledged spending by the court, which was a central focus of impeachment investigations and adopted articles. "I agree that expenditures prior to my election were ill-advised, excessive and needed greater oversight. As an important part of our government’s checks and balances, I will work with the legislature and support their oversight of the Court’s budget," she said. Suspended Justice Allen Loughry was also the subject of articles of impeachment. He was targeted in eight articles impeachment -- for failing to provide administrative oversight, lavish spending on office renovations, lying under oath, the overpayment of senior status judges and the private use of state resources, including cars, computers and furniture. The Senate needs 23 of 34 votes to convict and remove an elected public official from their position. Republicans hold 22 seats in the Senate.